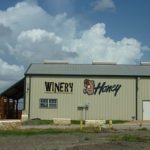 Darcy’s Vineyard is located in Hallettsville and is owned by Darcy and John Warren. John is also the winemaker. 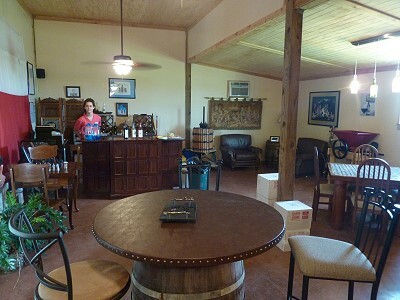 Production of wine began in May, 2011 and a tasting room was opened with an official grand opening on April 14, 2012 when the main floor of the barn was converted into the tasting room. 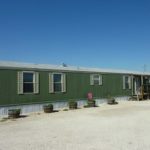 Darcy and John were looking for a location to plant a vineyard and start a winery and found 24 acres of land in Lavaca County. They began planting the vineyard in 2005, experimenting with many different varieties to find the right match for the climate, soil, and ecosystem. 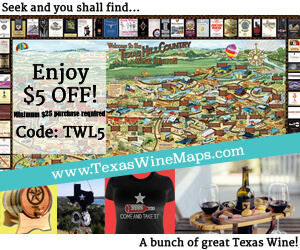 Their vineyard now consists primarily of Lomanto and Champanel (red hybrid grape varieties developed in Texas by T.V. Munson) and Sangiovese. There are a total of 500 vines. We were impressed with the main entrance and doors to the tasting room. 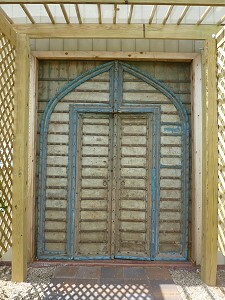 The doors are a set of 100 year old compound doors from Rajastan, India. Sarah greeted us and guided us through our tasting. Tastings are done standing at the tasting bar or you can sit at tables. 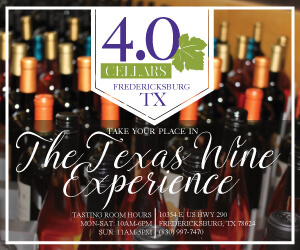 The tastings are complimentary for, at the present, four wines. Darcy’s Vineyard uses corks in their wines and the tastings are poured with a measured pourer. Hummus and chipotle sauce on cream cheese is provided with crackers to cleanse your palate and to enjoy the tasting. 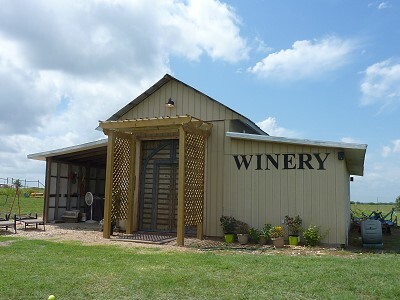 Darcy’s Vineyard’s signature line of wines is called Courthouse Wines (after the courthouse in Hallettsville) and features a Sangiovese, Chardonnay, and Blush. 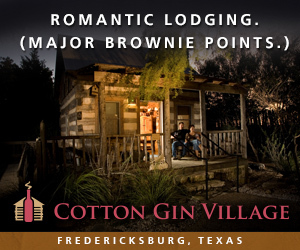 They also make a sweet Vanilla Mead from Texas wildflower honey, which is then infused with Madagascar vanilla beans. We were told when tasting the Vanilla Mead to taste the mead, eat some chocolate, and then taste the mead again. It definitely changed the flavor of the mead. A small gift shop is present with logo shirts and logo wine glasses. The wine glasses were a little surprising since the tastings are done using plastic cups. I learned a little about the wines from John Warren. 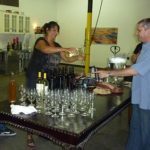 They make their wine in small batches, bottling 14 gallons at a time, so each one is potentially a little different, but their winery is evolving fast. He thinks they may have produced about 250 gallons of wine in the past year. 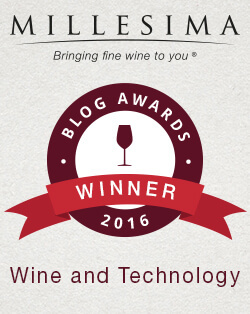 Their Texas Sangiovese is about 80 percent Texas and 20 percent Italian made from must. The Chardonnay is made with juice from the Suisun Valley in California (southeast of Napa). They had planned on using the out of state juice for the first year and then switch to local growers, but the response from their customers has been so positive they plan on continuing to make it the same way. The Blush is made from white gamay juice also from the Suisun Valley. 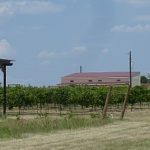 They have not found a Texas grower to supply those grapes, so they plan on experimenting with locally available varietals to create a Blush. 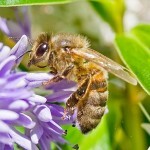 Each 30 gallon batch of the Vanilla Mead is made using six gallons of honey. 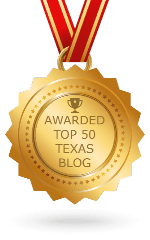 They use five gallons of Texas wildflower honey and one gallon of off-the-shelf honey because the apiary doesn’t sell it in six gallon buckets. 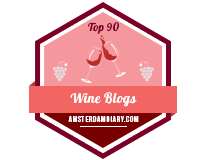 We did not get a chance to try their 2011 Estate red wine because they plan on bottling it the following week. 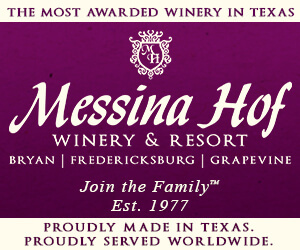 It will be about 85 percent Lavaca County, Texas grapes blended with a little Sangiovese from the Italian must. Darcy’s Vineyard also has a bottled but unreleased Cabernet Sauvignon that is nicknamed Chateau Doublewide. 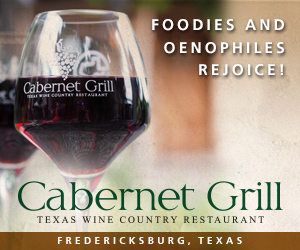 It is mostly 80 percent Texas Cabernet, Lomanto, and Sangiovese with 20 percent wine from a Chilean Cabernet must. 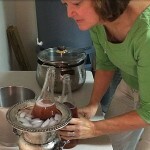 In the future Darcy’s Vineyard is planning on getting peaches from the Fredericksburg area for a Peach Chardonnay. 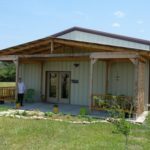 They also will be buying a ton of Blanc du Bois grapes from another Lavaca County vineyard this summer in addition to getting a ton each of Sangiovese and Cabernet Sauvignon from north Texas later this summer. As you can see, Texas is on their mind. Darcy’s Vineyard may be young but is already showing promise for the future.